When engraving is requested and completed, the item cannot be returned for an exchange or refund. We at Hillier Jewellers are offering a unique Eco-Friendly Gift Wrapping service on all Watches and Jewellery. Your chosen piece of Jewellery or Watch will come hand-wrapped and ready to give to your loved one. Sorry. You can add a maximum of 4 samples to your cart. Please remove some samples before adding a new one. Here at Hillier Jewellers we offer a fantastic selection of Hugo Boss watches which are available in a fantastic selection of metals, materials, styles, colours and prices to ensure you can find the perfect designer watch for you or as a gift for a loved one. Some of the materials available from the selection of men’s watches and women’s watches by Hugo Boss include; leather, rose gold, rubber, silver plated, and stainless steel. 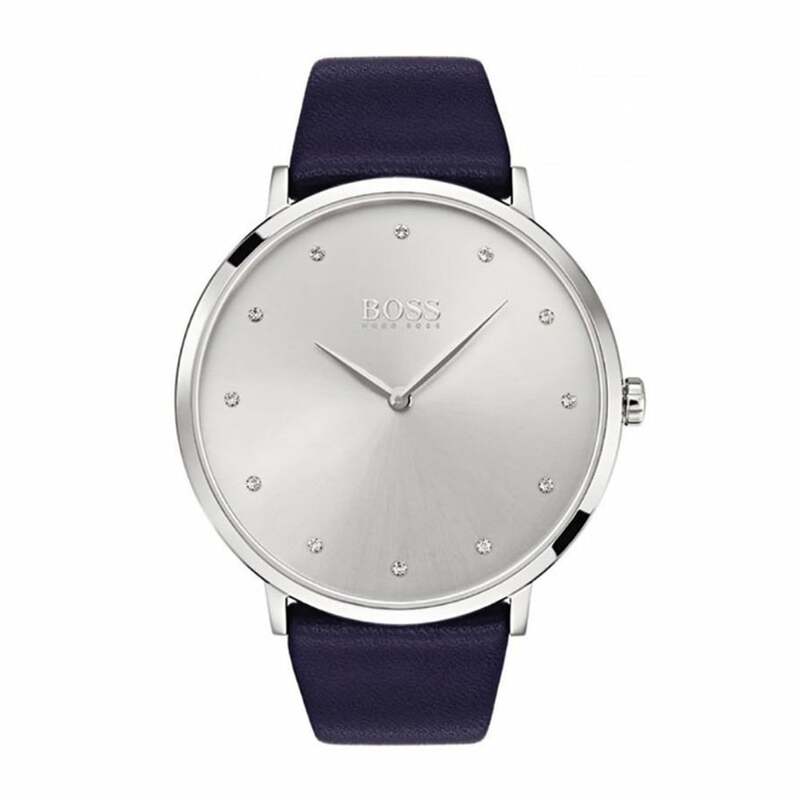 There is also a selection of dial colours to choose from in this range of Hugo Boss watches which vary from colours such as blue and red to classic black and silver. All of the fantastic designer watches by Hugo Boss will suit many smart and casual occasions as their sophisticated and luxury designs are created to ensure they can be worn for day to night use. Hugo Boss guarantee on the best craftsmanship that goes into each of their watches which is why they are such an excellent brand to choose. The complete range of watches at Hillier Jewellers features many other designer brands available for you to choose from in our ranges of stylish men’s watches and ladies watches. Royal Mail Special Next Day Delivery takes 1 working day and is guaranteed to arrive before 1pm. Saturday delivery is highly likely, however if you'd like to ensure this, please choose Royal Mail Special Next Day Delivery Saturday during checkout. Royal Mail Tracked is a Monday to Friday service. Royal Mail Tracked parcels may arrive on a Saturday, but we cannot guarantee it. If you want to ensure a Saturday delivery, please choose Royal Mail Special Next Day Saturday Delivery during checkout. On the day of dispatch, your order will be updated with a tracking number and Royal Mail will email / text you on the day of delivery. If there is no-one present at the delivery address, it may be left with a neighbour or Royal Mail may leave you a "Sorry we missed you" card with details of how to collect / arrange a redelivery for your item. If you’d like any special notes adding to the delivery note, please contact us. Royal Mail offer a "Safeplace" system on Royal Mail 24 & 48 services which allows customers the opportunity to nominate a preferred delivery location, a 'safe place' or with a nominated neighbour. If you'd like to nominate a Royal Mail Safeplace location on your delivery, please give us a call on 01642 245255 or reply to your order conformation email. It is your responsibility to collect your item or arrange a redelivery. If you do not collect your items or have them delivered within several working days, then your parcel will be sent back to Hillier Jewellers where you may have to pay for redelivery. European and International is available via Royal Mail International Tracked. European delivery typically takes 3-5 working days. International delivery takes approximately 5-7 working days. During busy seasons it may take a little longer. We may choose to use Royal Mail International Tracked & Signed For at our discretion. Please note that any order placed from outside of the UK Mainland will be processed & despatched at the discretion of Hillier Jewellers. All information provided must be correct for us to receive an authorisation from your issuing bank. If the information we receive from you is incorrect, or we are unable to receive sufficient authorisation from your issuing bank, your order will be cancelled & you will be notified as to the reason(s) why. When will my refund be processed? We aim to process your refund your within 5 working days of us receiving the item back. During busy spells this may take a day or two longer. You will be refunded to the full price of the returned products to your original payment method and we do not charge any 'restocking' fees. If you have paid for your delivery service, that cost is not refunded. © 2019 Hillier Jewellers. All Rights Reserved.